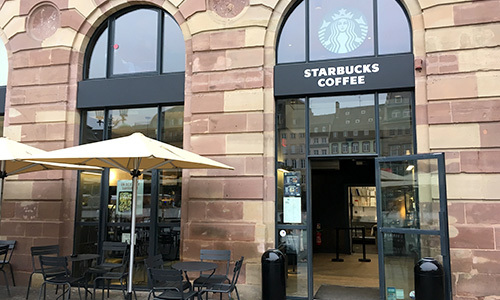 Starbucks has opened in Strasbourg! In April 2016, the famous chain specialised in whole-bean coffees moved into the heart of the Aubette Shopping Arcade, in France's Bas-Rhin département (67). Since 1971, Starbucks Coffee Company has been a committed producer and purveyor of ethical coffee. Today, the company is the leading roaster and distributor of high quality arabica coffee in the world. Thanks to its unwavering passion for excellence and its guiding principles, Starbucks offers a unique customer experience with every cup of coffee. Monday to Friday from 7 a.m. to 8:30 p.m.
Saturday from 7 a.m. to 9:30 p.m.
Sunday from 8:30 a.m. to 8 p.m.